3. "Come on dad, I am too old for this!" 1. A face off for his "b"
3. The guestroom is finished! 1. 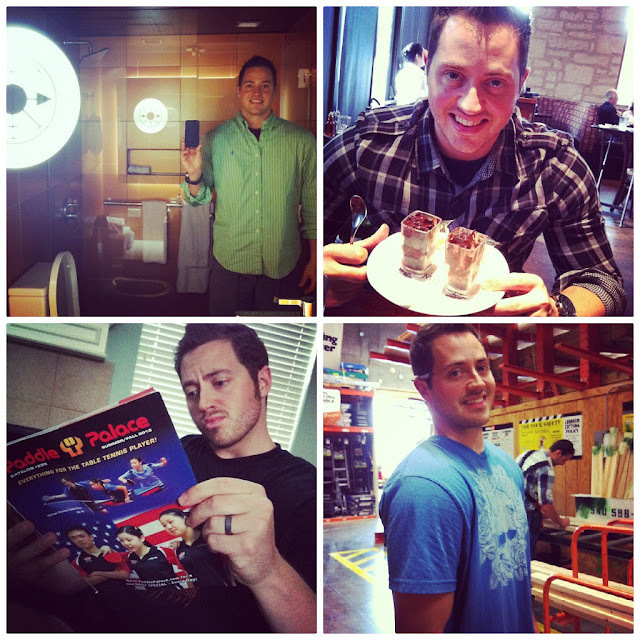 Total blog husband...love him! 4. I love being married to an engineer...comes in handy at Home Depot! Jon's dad passed away 3 years ago and we are having his car shipped down here full of his belongings. I never got to meet him so I am excited to get to know him through pictures and momentos. It will arrive Tuesday. I will definitely be sharing more about this later, the mustang is a project car for Jon. Yesterday afternoon my team had an offsite team building event at the lake. One coworker has a boat lease and we cruised Lake Austin, floated in the water and ate at Abel's on the Lake. Stuff like this keeps me sane. I love my city! You check each other for lice?! What?? So confused here !! Shorts to work?! I'm so jealous!!! This Memphis humidity is killing me at work hah andddd I have to walk several blocks to the car everyday. Oh well. I can't wait to hear all about Jon's Dad and the things you learn about him - that is so special. 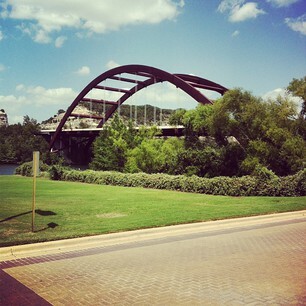 LOVE that picture of the pennybacker bridge (I think it's something like that, right? hah) and I love that I've seen it in real life! I mean, pictures really don't do that area justice - it's gorgeous. I love your pup.. like beyond adorable.. French bulldog? I have a frenchie and I love taking pictures of her. I'm glad youre enjoying your house..even if people be creepin! Lol. I love the official blogger comment because you have a bubble necklace. Seems like everyone has one. WOW!! You have been a busy lady! Yay for getting recognized! Next will be autographs!! ;) Love it! 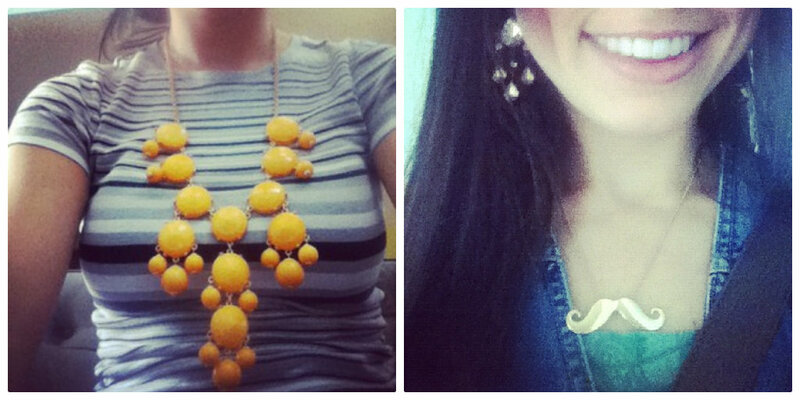 And I guess I am still not an official blogger because I have yet to get a bubble necklace! Maybe it's time! Have a great weekend, Ruthie! 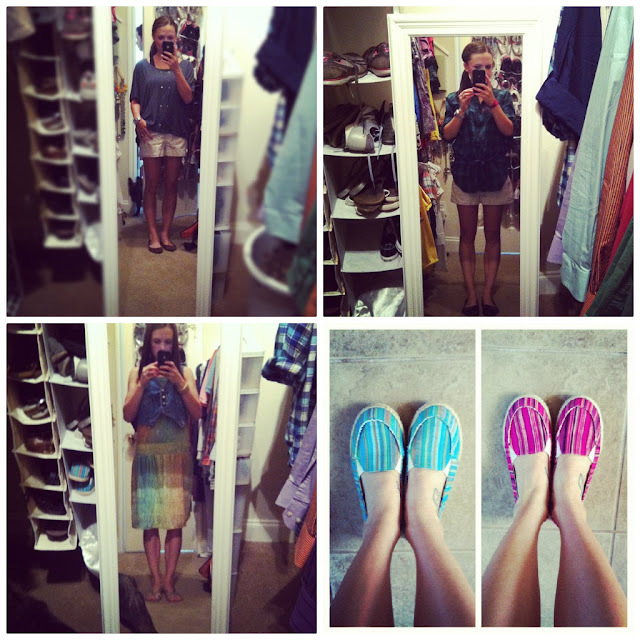 i love that framed picture, and your new shoes! JEST! Love it! And yes, WHY are you checking each other for lice??? You are so famous, getting recognized and all! Have a great weekend friend. you killed me with your comment about the "baubble" necklace and being a true blogger hahaha you crack me up! Oh and I have been having problems with my google account, but it let me follow your blog via twitter through your GFC, who knew you could even do that?! 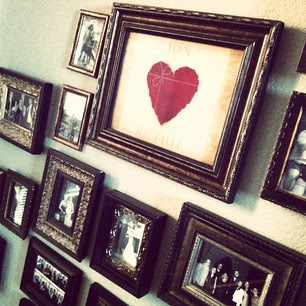 I'm kind of obsessed with your new gallery wall!!! How does it feel to be famous?! p.s. The paddle palace picture made me laugh out loud. If I did all the things you did I think i would have to rest for 4 days. I think it's so cool that y'all are getting Jon's dad's mustang! And can I say you have the best hair ever? It's so beautiful! Oh my goodness, how sweet is Ernie's "dad I am too old for this" face!?! He looks like his friends just saw his mom kiss him when dropping him off at school. So cute!! is that a table tennis magazine? ?that is so frigging random-love it!